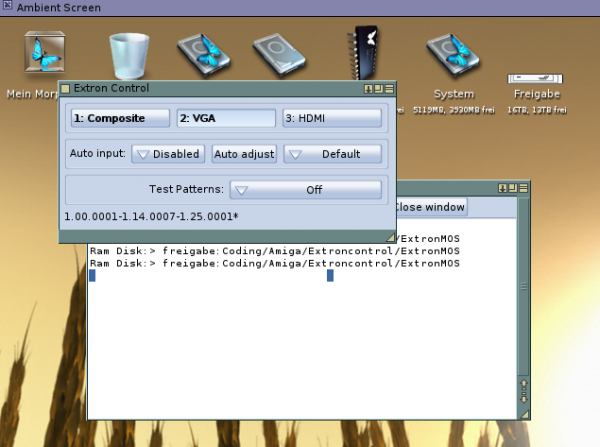 First real release of the Extron Control as Version 0.1. Control Software for Extron DSc 301 HD, Scaler and input switch. 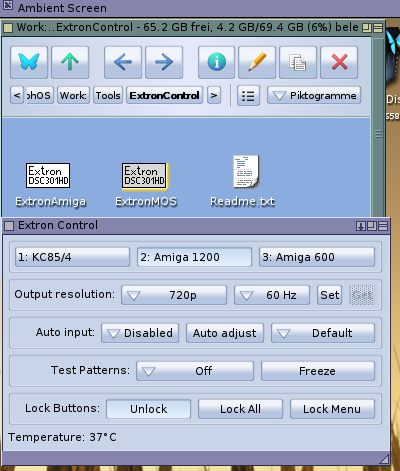 With the new version you can configure, which parts of the GUI is visible (via tooltypes) and also configure the names on the Input Switch Buttons and which serial device to open and search for the Extron DSC 301 HD. 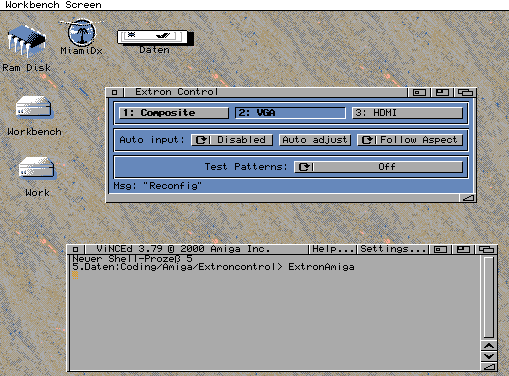 For Amiga and MorphOS the executable is included. But the source is also in the archive, hence one could compile them for AROS or OS4. (it just needs the latest Version of MUIClass). Hey ALB do you like all old computers or only Amigas. I bought that device, its a very nice scaler nicely usable for old computers to bring the image in a good quality to modern monitors. I supplies a serial interface for controlling (beside the on screen display) but only a Windows program to use it. I wrote a little program to operate this device from Amiga/MorphOS (where you can use the USB connector at the front panel as a USB2serial bridge). Already working very nicely, some screenshots. You can switch the inputs, it shows which input is selected (it also notice the change when you using the front panel). When an input has a usable signal the button is printed in bold. It’s an very early version but works already nicely, if someone it interested I just make a download available here (binaries for Amiga68k and MorphOS and the full source, licensed under CC0, it needs the last MUIClass package to compile, just yesterday I fixed some bugs there, should also compile for the other Amiga platforms) have fun. Until now I always used VNC remote desktop to record MorphOS Videos of my FreePascal programs. I already bought before a standalone capture device but it did not work, even I set the screen mode to 720p or 1080p the capture device do not recognize the signal and therefore does not record anything. Now I got an “Elgato Game Capture HD” with this it seems to work when you set the screen mode in MorphOS to “1280×720 (50 Hz, 37.5kHz) 720p” the 60 Hz seems not to work. I packed Sodoku as an ADF, not bootable becasue it needs intuition.library, so you have to load Workbench first. It needs around a 1.5 Mb RAM. Sadly I still not get the newer FPC Version to work (strange crashes, looks like some memory corruption, because it always crash at different positions) so the executable is still rather huge (550 kb vs 52 kb) and therefor needs a lot of memory to load it. I dig out my old Version of FreePascal for Workbench 1.3 and I tried to use it with the latest FreePascal, and it seems not to work. Thats bad because the smaller exe size was after that, so the executables are still quiet big. So I should check again how to do that. But first I played a little bit with it and wrote a little Game for the Workbench. 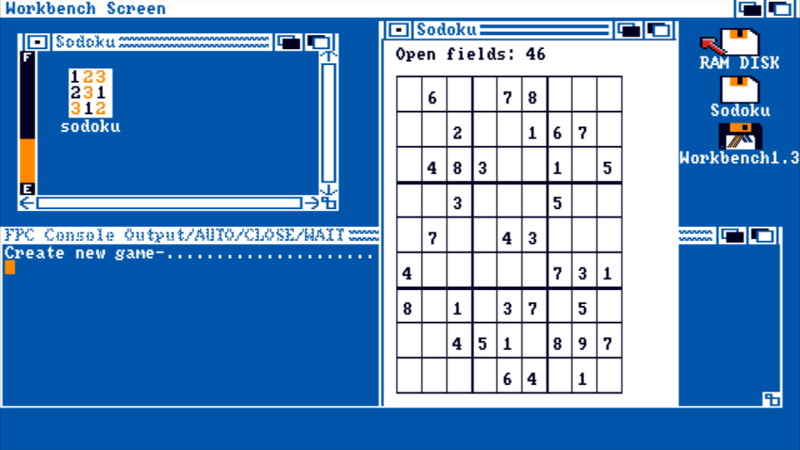 A Sodoku which worked quiet nice, just the graphics is rather difficult because many of the convenience feature to create Bitmaps and rastports and so on are not there so you have to do it by hand. MAybe you do not know it but FreePascal turned today 25. On 8th June 1993 Florian Klaempfl started with current FPC source base. I will take this opportunity to say thanks for that. It’s an awesome program and becomes better and better Also thanks to ChainQ which gave me the the chance to use my favorite language on my favorite computer system. I tried the MUIMapparium on my real Amiga 1200 with 680030 50 Mhz (With 68882 FPU). Good news, it works somehow, of course it is slow but once the images are loaded, it moves ok. Unitl now it freezes a little bit when release the mouse button… maybe I should try to find the reason for that. 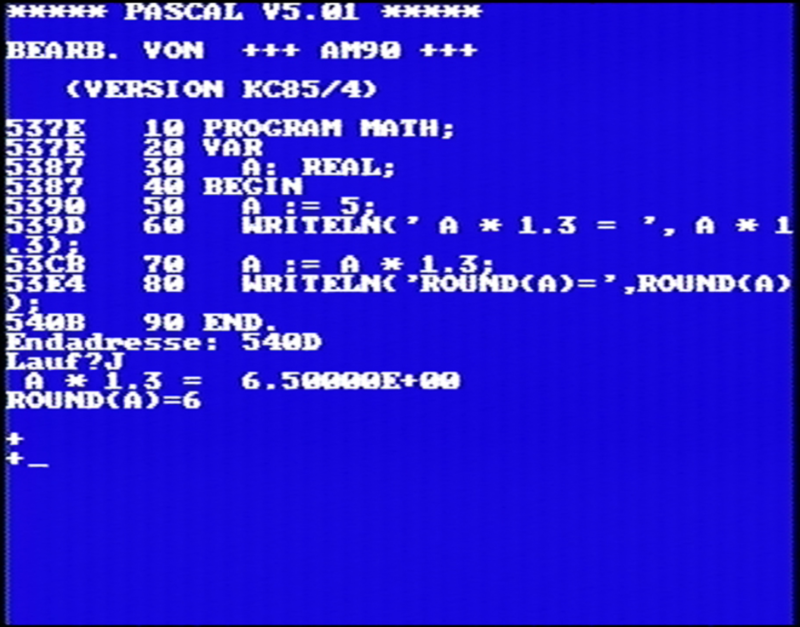 I also tried on a 16 color screen, much faster… but looks awful 😉 so I decided to make the Video with a 256 colors screen 😉 even it’s slower. Still playing with Datatypes in principle not so difficult, maybe could make it a little bit easier with some wrappers. The Datatype system even take care of scaling the image to the actual screen depth and dither the image if needed. Until now MUIMapparium need a 15Bit+ Screen because I use Cybergraphics functions to draw the stuff to window. 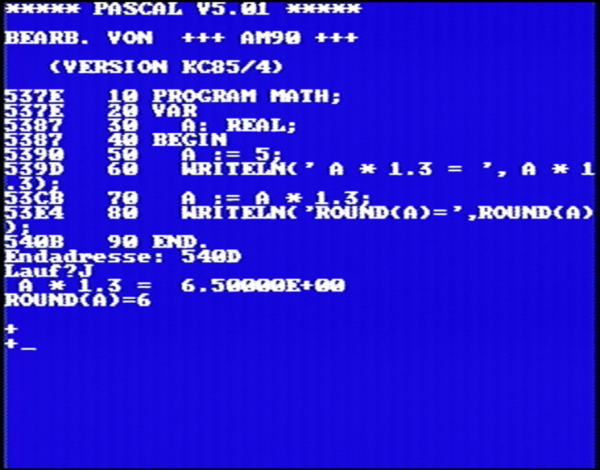 But when loading the pictures with the Datatypes it would even run on an AGA screen with less colors. I gave it a try and the first version works rather nicely. Of course it’s just a ugly hack until now, not at all optimized and maybe even crashing or eating memory. But maybe worth investigating a little bit as alternative. I added some debug output at AmigaOS4, so if you experience problems starting up MUIMapparium on OS4 check the debug output (e.g. Sashimi) it should count from 1 to 26 on the bootup, check if any numbers missing and send me the result on one of the forums I’m usually on.